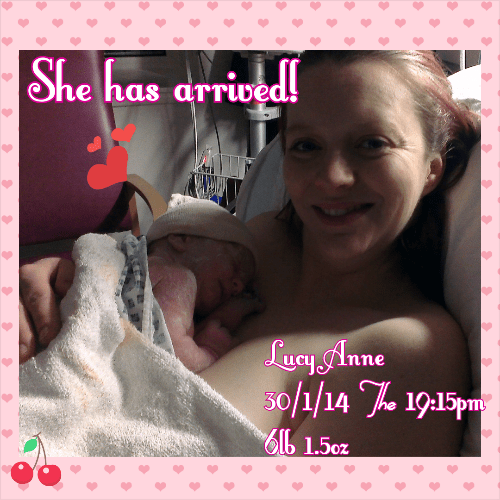 Lucy was due to be born by section on Monday 3rd February, and in all honesty I did think I would have gotten to that date but she had to prove me wrong and arrive just a few days ahead of schedule. On the Thursday (30th Jan) I woke up about 7ish feeling pretty blah, and cramping something terrible. Didn’t think nothing of it as just put it down to her moving and getting ready, but the tightness feeling started happening a bit more often and I thought it might just be Braxton hicks as they weren’t strong or lasting over a minute. I think within myself I knew that things were moving in the right direction of labor starting and that I was in fact going through the pre-labor stages. I have never really experienced that with the boys, as my waters broke then the contraction started – so again this was new territory for me. I got an app for my phone to time the hicks (as that’s what I thought they were) and it was ranging from 7-10 min apart to the longest being 30 min and all lasting just over 40sec. Gave my mum a call and asked her to come up and look after the boys, just in case I needed to head to the hospital later on, she arrived about 10:30 and it wasn’t until about 2pm that I decided to call triage and see what they said. They basically told me to get to the hospital as soon as possible and they would check me out. We got there about 3ish after picking Jack up from nursery and making sure mum was ok with the boys. The Dr was a really nice guy and he examined me and said I was 1-2 cm dilated and that they would just aim for me to have the little one this side of midnight that night! I was well happy with that, as I had visions of being sent home and then my water breaking and potentially giving birth to her at home, since he could feel her head! The Dr also asked my stance on getting sterilized at the same time, and as I was having doubts, he said they wouldn’t do it anyway if I was having any doubts at all, so that sorted that debate out. Just need to work out what other contraception to use in a few weeks time. I was up in the labor ward by about 5:30pm and it was just a matter of waiting as to when they could do the section, as they had to make sure enough time had passed from when I last ate. Lee headed home at his point to quickly fill mum in and get everything organised for her sleeping over that night. He had just arrived back at the ward about 6:30pm when they came in and said it was time to head to theater. I left him a wee room to get changed into scrubs to waif until I was all ready. The spinal was tough, the anesthetic had trouble getting it dead center, as I could feel a weird sensation on my left side when she was poking the needle in so it was about three attempts to get it right. Thank god it was right as I was paranoid I would be able to feel everything that they were about to do to me! Once numb from the waist down and the cover in front on my face Lee was brought in and I was so glad to see him. The drugs turned me into a right chatterbox, mainly because it was it was taking my mind off all the tugging a d pulling. If you have had a section then you know what I am talking about, for those they havent this is the best way to describe it – imaging you have a hand bag full off stuff and you have to rummage about to find your keys, go do it see what I mean… That is what the feeling of a section is like – someone rummaging about your insides. The longest part was closing me back up, but I was back to the labour wars by about 8:30 with Lee and little Lucy. I got some tea and toast before the midwife came back and got me freshened up with a bed bath and some drugs. It was about 11:30/midnight before I got to the ward and that is when they sent Lee home – I didn’t really want him to go, but had no choice.